Can we preserve our social values & still have a prosperous economy? One of the key concerns at Social Policy Connections has been how to maintain our social and community values as Australia adjusts to rapid economic change. Everyone wants a prosperous economy, but there is less agreement about the distribution of resources and social equity. As we have reported over the 13 years of Social Policy Connections, growing inequality is threatening to undermine living standards for many people, not just in Australia, but also in Europe and the United States, the heartland of western prosperity. Social dis-ease is fomenting political instability and the rise of xenophobic nationalist movements, threatening to fragment systems of international governance, just as China is flexing its economic and strategic muscles. 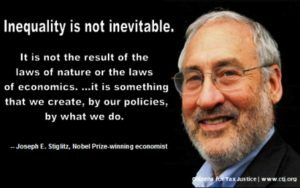 As many have attested, driving the economic policies exacerbating inequality is the ideology of what is termed neoliberalism. In this issue of SPC News, John Menadue challenges views coming from the political right that concerns about inequality are simply the “politics of envy”, the old left-wing class war propaganda. Menadue argues robustly that the class war is indeed real, but it is being waged by the rich against the majority, especially the real battlers. In a response to Richard Denniss’s Quarterly Essay “Dead Right: How Neoliberalism ate itself and what comes next”, Rosalind Dixon argues in “Partially right: rejecting neoliberalism shouldn’t mean giving up on social liberalism” that correcting problems with neoliberalism does not mean giving up the benefits of socially responsible markets. Pope Francis has often highlighted the problems arising from growing inequality, criticising strongly the astonishing gap between the rich, especially the very rich, and most people, notably those severely impoverished. Along with his predecessors, the Pope blames extreme versions of neoliberalism as a rationalisation for greed. Bruce Duncan sketches the Pope’s economic views and responds to some of his critics. Francis is trying to build alliances with business, economists and scientists along with civil and religious leaders around the world to tackle these global issues, in collaboration with the UN Sustainable Development Goals. The Middle East remains very volatile, not least because of setbacks to the peace process between Israel and the Palestinians. Former Australian Ambassador to Israel, Peter Rodgers, warns that the collapse of prospects for a two-state solution will result in dire outcomes for both Israel and the Palestinians. Recently returned from a meeting in France of Pax Christi International, Caesar D’Mello reported at the SPC Forum on 21 June on how Church and other networks are questioning the effectiveness of ‘just war’ thinking, and are endorsing non-violent ‘just peace’ methods for promoting human rights, social change and sustainable peace-making. SPC continues to keep a watching brief on these and other social and political problems, attempting to run a moral compass over them to determine their social impact, critique policy failures and suggest better ways forward. As you will have seen in our recent invitation to renew your membership or make a donation, we have been in conversation with the University of Divinity and other groups about contributing more effectively to the public conversation. Revamping SPC with a higher profile will require added resources and personnel, and we are grateful for the help and welcome suggestions from our supporters.